Do we call it a coincidence or sheer luck? But we at iGadgetsworld were successful in purchasing the newly launched Xiaomi Redmi 1s in the very first attempt. Not just 1 or 2 but 3 Xiaomi Redmi 1s were purchased during the sale of September 2nd by our team. Want to know how we did it? Keep reading on! First of all we followed our previous post regarding the Best tips and tricks to successfully purchase Xiaomi Redmi 1s. Have a thorough read so that you can increase your chances to buy one piece of the smartphone. No worries if you’ve missed your chance this time. Soon registration will start for the next sale and you’ll be able to get yourself one if you completely know what to do! You can also check out our comparison between Xiaomi Redmi 1s vs Moto E to clear your mind as to which one you should opt for. The 1st thing we did was that all our team members registered for the sale of Xiaomi Redmi 1s on 26th August 2014 at 6PM. This is a mandatory step or else you wont be eligible to participate in the sale. We had to prepare ourselves for the sale as no past result were present to predict how the sale would go. All we knew was 40000 pieces were available and more than 250000 registrations were done. The chances of getting a piece were bleak as you can see. Today i.e on the day of sale we logged into our FlipKart account 2 hours before the sales was about to start. It is very important to be online during the sales or you cant expect to get your hands on the smartphone! 2 members were online via PC and one of our member was on via the FlipKart app. We ensured that address was already filled up in the address book to fasten up the purchase process. It is better to keep reloading the Xiaomi FlipKart page to keep a sync with the counter. Try your last reload when only 20 seconds are remaining. This will ensure that you are in proper sync with the FlipKart server. As soon as the counter went off the BUY NOW button was made available. With a blink of a second, I clicked the button and had the Redmi 1s registered successfully! As stated, I avoided refreshing or closing the tab of the browser to let FlipKart do its job of adding the phone to my cart. But due to the heavy traffic FlipKart was not able to add the smartphone to my cart but had it reserved for it and asked me to try after 15 minutes to carry on the checkout. After 15 minutes, I proceeded with the purchase and checkout was made successfully! 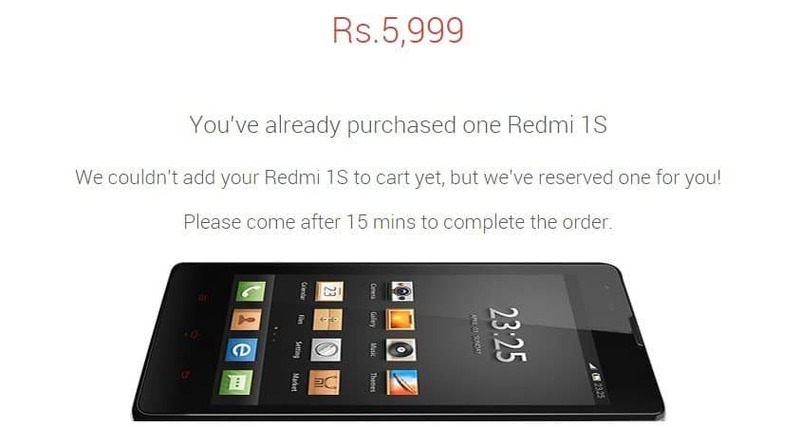 This is how we successfully purchased Xiaomi Redmi 1s on the day of sales. MI India tweeted that they went OUT OF STOCK in just 4.2 seconds. So getting 3 in such a small time is quite a feat we believe! Hope you guys are successful in making a purchase in the next sale. The next sale is scheduled on 9th of September so be ready. Next articleSony Xperia Z3 vs Sony Xperia Z3 Compact: Which to Choose?